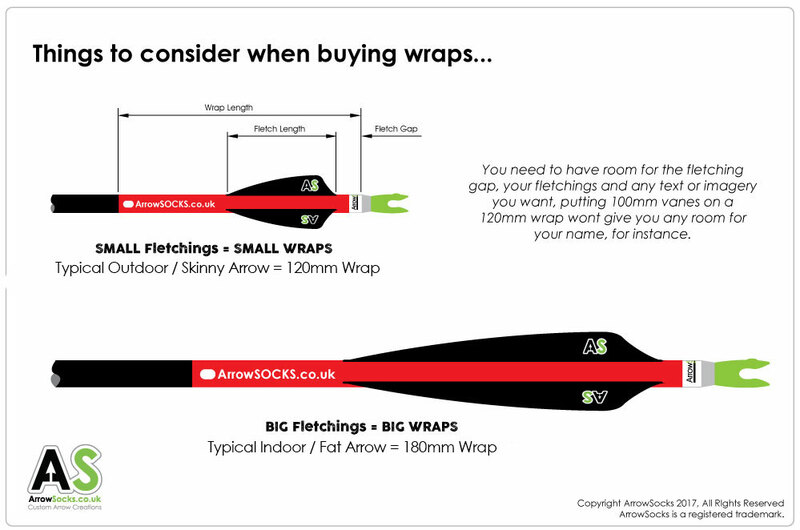 The informaiton below should help answer some of the most frequest questions we get and help you decide on the spec for your wraps. 1) What length wraps should i have? 2) How many wraps do i get? 3) Can you number the wraps in any way i like? 4) How do i fit the wraps? 5) How easy are they to remove and whats the best way? 7) How quickly can i have my order? 8) Is your shop safe? Is payment secure? 9) How do i get on your Pro Staff? 10) What glue should i use for fletching with wraps? 11) How do i know what size wraps i need? This depends on a number of variables, covered in the image below. You'll need to take into account the text you want, the length of fletching and the gap between fletching and nock you want, plus a little big of room so the wrap isnt too cramped. As a rule of thumb, but heavily depends on your fletching length, outdoor arrows tend to be 120mm in length and indoor 180mm. Yes - if you cant find the option you need, pop in a note or send us an email - all wraps are made from scratch and everything is editable. Fear not, instructions come on the backing card of every set we send out - and its not too hard! 6) Do you ship to *insert country name*? Yes - we ship worldwide, the shop will show you shipping options before you check out. We've tried to provide a selection from budget to premium for you to choose from. Shipping times vary on time of the year and the country they are going to, France, Germany etc tend to be under a week. For wraps and things, obviously we have to make them - we don't have a set on the shelf in your unique deisgn with your name on, in your size... but we do try to get orders out as quickly as possible, meaning wihtin 24 hours of ordering normally. If theres a delay, we will let you know (we occationally get caught short on materials etc). First class post in the UK is next day 90% of the time (xmas you'll see it stretch to about 5 days!). Special Delivery is guarenteed next day - Next day being the day after they are posted, not necessarily the day after you order. We will prioritise Special delivery orders, but it takes us time to manufacture things and there are post cut off times - your item may be posted next day, to be received the day after. If you're in a hurry - contact us and we'll do our best to accomodate you and get your order made ASAP. In short, YES! We take security very seriously, we keep the shop software up-to-date and operate SSL security (the green padlock in the address bar) so any personal info is encrypted before it is sent. Payment is safe however you choose to pay - non of the available payment methods involve us seeing your payment details, no card number etc are ever seen or stored by us, its all dealt with by the payment companies. Wether you choose PayPal, Sage (Card) or Amazon payment, your details and money will be safe. Any data you provide us with is required to fulfill your order, such as your name and address, all of this data is securly stored and never shown, given or sent to anyone else unless required to fulfill your order - we have to send your details to Reign for example if you order a string. Send us an email... we get a lot, so please don't get upset if we don't reply - we will read it! We currently have a lot of Pro Staff so aren't looking to take any more on until such time as weve worked out a better system that works for everyone involved. Fletching glue... sounds daft but they are specifically formulated for the job. We've seen customers have issues with "Normal Superglue" for instance, fletchings fell off. Stick with pretty much any fletching glue, we favor AAE Fast set due to its ease of applicaiton and fast setting'ness. If your using AAE WAV vanes - you MUST use AAE MAX BOND glue - it's the only thing that will stick them due to a substance on the base of the vane. Be careful not to overdo the glue - most tend to be solvet based which will react with the ink in the wraps so wiping away large volumes of squeezed out glue may result in some odd colours on yoru wraps - use enough, not too much! On our adverts, there's normally a "Size" drop down box for you to choose. We have on file, nearly all main stream shaft sizes - so it is always best if you can to simply give us the make, model and spine of your arrows. E.g. Easton, ACC, 3-04. We can then work out the exact size you need and you can select the CUSTOM option in size. There will be a text box below it for you to enter the details into. 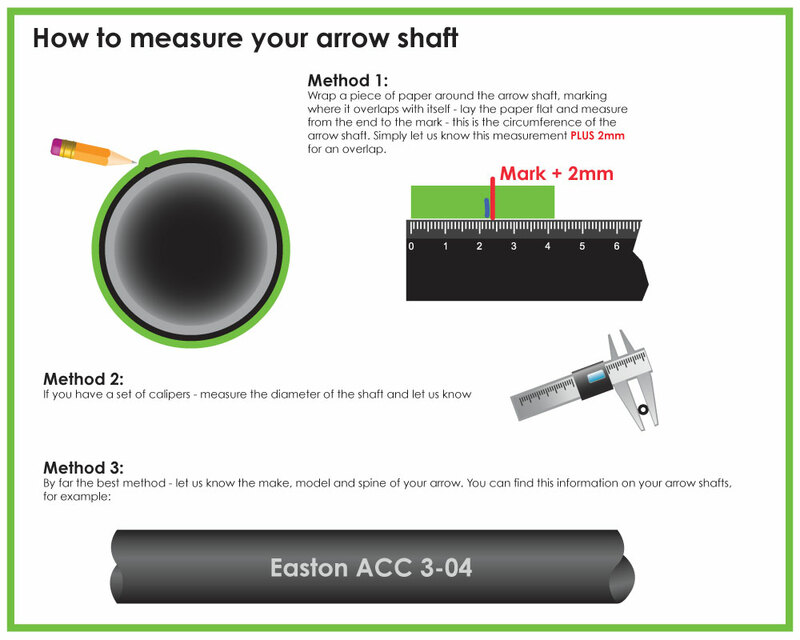 If you're one of the few who have obscure arrows we don't have on file - or you simply want to measure them anyway - please see the graphic below which give you a couple of methods. Method 1 is the most un-scientific but will work, Method 2 is best if you have access to Vernier Claipers.